I had been last week to Nandi Hills with my fiance. The place seems excellent for a short weekend getaway. We were there only for a part of the day, but ideally its a nice place to stay. There are 2 hotels to stay. One being Mayura Pine Guest House and the other being the horticultural bungalow in the hill. I am not too sure about the rates, but I guess it wont exceed Rs 500 a day. 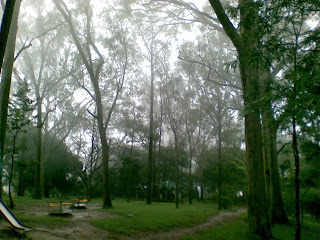 Its ideal to go there in the monsoons when the mist makes it lovely to wander around the park. The only turn off there are monkeys who would scare you to death, by holding you at gun point and ordering you to give any food material you have. You should be careful, in not having a light bag, as the monkeys know to pick your bags. The monkey tried my bag, but thankfully it was very heavy due to my disorganised packing. The place is lovely for long walks in the woods, and is commutable by public transport from Bangalore. Its 2-3 hours by road and its advisable to take the State Transport buses directly or go to Chikbalapur and then go to Nandi Hills. (Majestic Bus Terminus), as it gets difficult to drive a Car/Bike in the mist on curvy mountainous terrain. We had our brunch and Linner at Mayura and it was a fairly inexpensive place, with basic food items being cooked. Lunch doesnt have too much of a menu, as they make what people consume the most. Roti Dal/Rice wins hands down. For people looking at Alcohol, Mayura also serves alcohol, which to me appeared strange as all through the journey, i saw signs saying Nandi hills has prohibited consumption of alcohol. It also forms a good weekend break from Chennai, if you are tired of trips to Ooty, Pondy, Mahabs and Kutralam. The 7 stages of a Tam Brahm Life!